Felines were born to be adorned. Crushed velvet collars do that and more, with amulets that sparkle as they protect your cat from evil spirits and invisible apparitions. 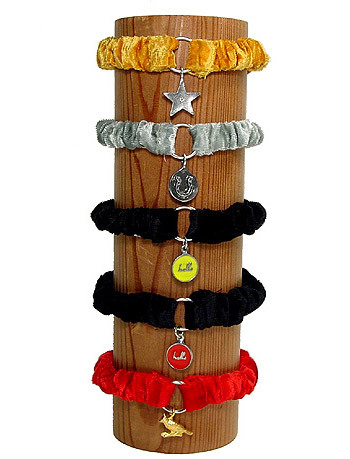 You may choose any color collar and match it with the charm of your choice, or order the charm alone. Please indicate collar color, charm, and size below. Individual charms are $13; charm/collar combinations are $26. Shown top to bottom: gold velvet with star, silver velvet with lucky horseshoe, black velvet with yellow enamel “hello,” black velvet with red enamel “hello,” crimson velvet with gold cardinal.